While this is the most common definition of nanotechnology researchers with various focuses have slightly different definitions. 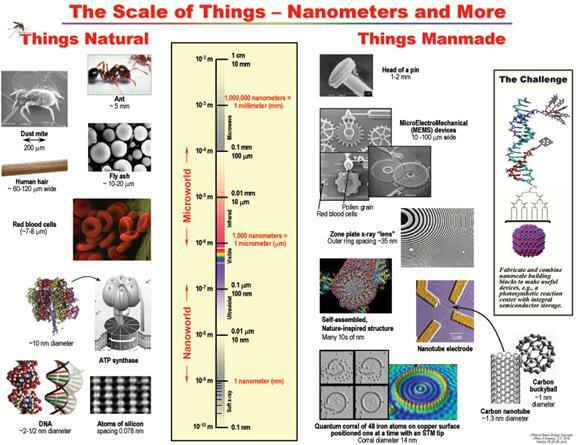 The following illustration titled “The Scale of Things”, created by the U. S. Department of Energy, provides a comparison of various objects to help you begin to envision exactly how small a nanometer is. The chart starts with objects that can be seen by the unaided eye, such as an ant, at the top of the chart, and progresses to objects about a nanometer or less in size, such as the ATP molecule used in humans to store energy from food.